Presented annually, this public keynote was instituted in 2001 to promote issues of diversity, freedom, civil rights, and social justice in order to commemorate King’s legacy. The Office of Minority Student Affairs (OMSA) and the Office of the President host the commemorative address, a kickoff event of Black History Month. OMSA also hosts an annual meeting with student leaders and the Martin Luther King, Jr. Commemorative Address speaker at the Douglass Leadership House (DLH). The MLK Jr. Commemorative Address Committee welcomes recommendations for future speakers. You can submit your recommendations using our online form. 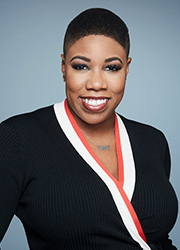 Symone Sanders, former press secretary for U.S. Senator Bernie Sanders' presidential campaign, democratic strategist, and CNN political commentator. She will deliver the University of Rochester's 2019 Martin Luther King, Jr. Commemorative Address on Wednesday, January 23. The event is free and open to the public and starts at 6 p.m. in the Feldman Ballroom on the River Campus. 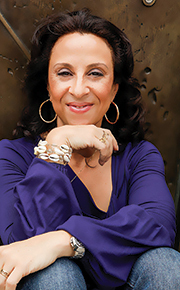 Maria Hinojosa is anchor and executive producer of the Peabody Award-winning show, Latino USA which is distributed through NPR. She is also anchor and executive producer for the PBS series America by the Number with Maria Hinojosa. She will deliver the University of Rochester's 2018 Martin Luther King, Jr. Commemorative Address on Friday, January 19. The event is free and open to the public and starts at 6 p.m. in the Strong Auditorium on the River Campus. 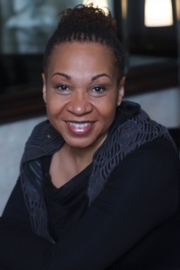 Dr. Joy DeGruy is an assistant professor of social work at Portland State University and author of Post Traumatic Slave Syndrome: America's Enduring Legacy of Injury and Healing. 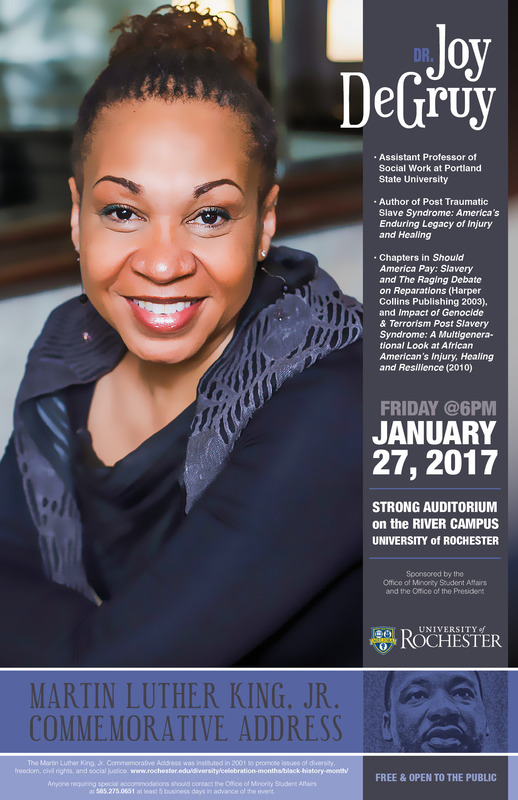 She will deliver the University of Rochester's 2017 Martin Luther King, Jr. Commemorative Address on Friday, January 27. The event is free and open to the public and starts at 6 p.m. in the Strong Auditorium on the River Campus. 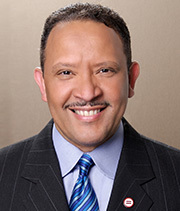 Marc Haydel Morial is the President and CEO of the National Urban League. 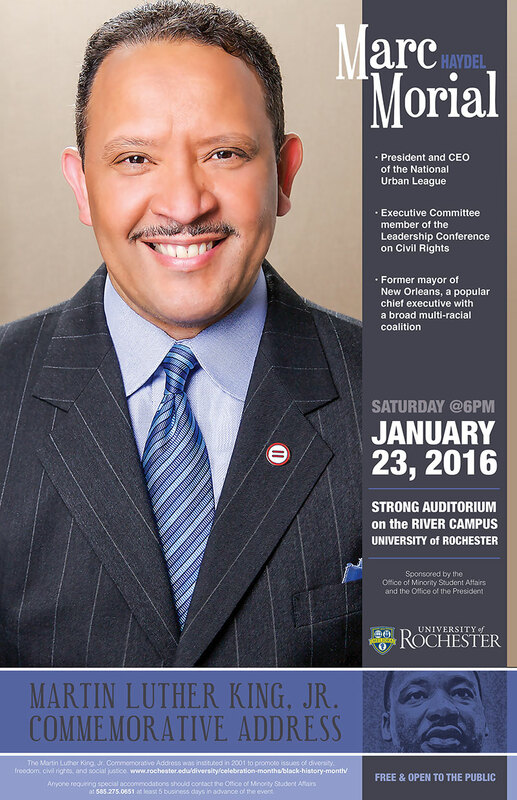 He will deliver the University of Rochester's 2016 Martin Luther King Jr. Commemorative Address on Saturday, Jan. 23. The free talk begins at 6 p.m. in Strong Auditorium on the River Campus. 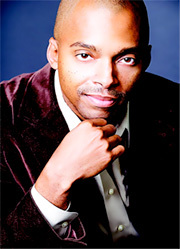 Khalil Gibran Muhammad is the director of the Schomburg Center for Research in Black Culture, an archive repository for information on people of African descent worldwide. 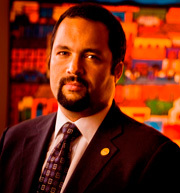 Benjamin Todd Jealous, the youngest president in the history of the National Association for the Advancement of Colored People, delivered the University of Rochester's 2014 Martin Luther King Jr. Commemorative Address on Friday, Jan. 24. The free talk begins at 6 p.m. in Strong Auditorium on the River Campus. As a political analyst and host of her own MSNBC current affairs program and professor of political science at Tulane University, Harris-Perry's address focused on racial issues, religious questions, and gender concerns related to American politics. In a speech that quoted extensively from the works of Martin Luther King Jr. to Kanye West, author, MSNBC political commentator, the Georgetown professor Michael Eric Dyson kept the crowd in Strong Auditorium enthralled during the MLK Commemorative Address. Dyson challenged the audience to use King's example to fight new forms of bigotry. "Don't be bigoted against the young," he said. "Maybe if you lift their hopes, aspirations, and dreams, their pants will follow." 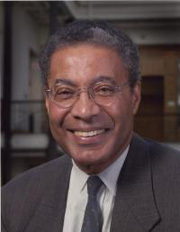 Harvard University psychiatrist and noted author Alvin F. Poussaint is perhaps best known for his decades-long collaborations with actor and comedian Bill Cosby. He served as a script consultant to both The Cosby Show and A Different World, ensuring that the humor in the sitcoms was appropriate for all ages and that the script portrayed a positive image of African Americans and avoided stereotypes. Reverend Dr. Joseph Lowery's work in social justice has spanned more than half a century. His involvement in the movement began in the mid-1950s and he was at the forefront of the Montgomery bus boycott in the wake of Rosa Parks' arrest. As leader of the Alabama Civic Affairs Association, his efforts focused heavily on the desegregation of buses and public places and workforce equality. Over the course of three decades, Lowery also served in several leadership roles with the SCLC, including president and CEO. 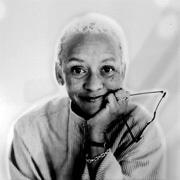 Giovanni, poet, writer, educator, and activist has authored more than thirty books in three decades; by weaving poetry with music and prose with pictures, she served as a strong voice for the black community during the civil rights movement. Her children’s book, Rosa, which depicts civil rights hero Rosa Parks, received a Caldecott Medal and reached No. 3 on the New York Times bestseller list. Young, business leader and former U.S. ambassador to the United Nations, was a top aide to King during the inception of America’s civil rights movement and was with King in Memphis when he was assassinated in 1968. Young was jailed for his participation in the civil rights demonstrations in both Alabama and Florida, and played a key role as a mediator between black and white communities in Birmingham, Alabama, in 1964. That same year, Young was named executive director of the SCLC, becoming one of King’s principal lieutenants. Human rights advocate Rev. Jesse Jackson called the audience to action in his speech titled "Linked Fate: 'Injustice Anywhere is a Threat to Justice Everywhere'." The theme is based on a quotation by Rev. Martin Luther King Jr., with whom Jackson worked at the Southern Leadership Conference in the mid-1960s. The second-oldest child of Dr. Martin Luther King Jr and Coretta Scott King spoke on "My Father's Dream: My Mission." King is a human rights advocate and community activist who directs the King Center in Atlanta. Edley Jr., the first African-American dean to lead a top-ranked U.S. law school, talks with J. R. Santana Carter '04 after delivering his Martin Luther King Jr. Commemorative Address. In his talk, Edley addressed "The New Civil Rights Agenda" and the relationship between race and politics. Dees, a civil rights attorney famous for his legal victories against white supremacist groups, speaks to students and staff at a reception preceding his address, "Responding to Hate: Voices of Hope and Tolerance." Berry, chairwoman of the U.S. Commission on Civil Rights, reminded audience members that everyone must do their part to "break down barriers" and ensure that all people have access to quality education and health care. Bond delivered the inaugural Martin Luther King Jr. Commemorative Address on the topic "Civil Rights, Now and Then." Bond was a founder of the Student Nonviolent Coordinating Committee in 1960 and chairman of the NAACP.